Submersible VORTEX pumps for professional use. Built using quality materials and oversized, extremely reliable and suitable for continuous heavy duty service. 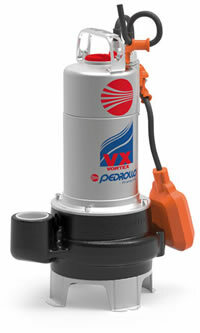 VX pumps are designed to lift dirty water which is not chemically aggressive to the pump components. Their construction makes them particularly suitable for DOMESTIC, CIVIL AND INDUSTRIAL applications, in all cases where suspended solids up to Ø 50mm have to be dealt with, such as water mixed with mud, groundwater and surface water. RECOMMENDED APPLICATIONS INCLUDE DRAINING FLOODED AREAS SUCH AS BASEMENTS AND GARAGES, UNDERGROUND CAR PARKS, WASHING AREAS FOR MACHINERY, PUMPING DOMESTIC WASTE, EMPTYING CESSPITS, AND THE DISPOSAL OF SEWAGE, DIRTY AND WASTE WATER. PUMP BODY in Cast Iron with UNI ISO 228/1 1½ or 2 inch gas threaded delivery port. AISI 304 stainless steel OPEN VORTEX IMPELLER (technopolymer on request). DOUBLE SEAL silicon carbide/silicon carbide on the pump side and lip seal on the motor side, with a barrier oil chamber (bio-degradable) to lubricate and cool the sealing surfaces in the absence of water. Sealed induction MOTOR: with double impregnated class F winding (ensuring extended motor life and wide range of use), designed for continuous duty, even with the pump partially submerged (min. 250mm). A thermal cutout device (motor protector) is incorporated in single phase models. Neoprene "HO7 RN-F" submersible SUPPLY CABLE (10 metres standard).